Northampton Town boss Gary Johnson has said that striker Tadhg Purcell may go on loan to former club Darlington to regain match fitness. The 26-year-old injured his knee and was ruled out for the 2010/11 season after just six appearances. "Tadhg is at a stage now where it would be good for him. Darlington could give him an opportunity," Johnson told BBC Look East. "He'd be going there to get some games and we'd assess it from there." He continued: "I've only seen him training, and I don't know what he was like previously, so it'd be good to see him in games [to decide] whether he becomes part of our squad for the rest of the season. "He might need to prove that away from here because he may not get the chance in the first team." 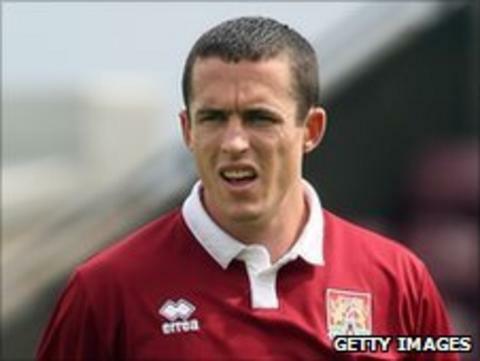 Meanwhile, midfielder Kevin Thornton has been ruled out of the Cobblers' pre-season matches for up to three weeks to recover from a hernia operation. Johnson has also confirmed that transfer-listed Ryan Gilligan is not in his current plans for first-team football at Sixfields and that forward Michael Uwezu, who scored in the penultimate game of the season against Stevenage, has not been retained. Of Gilligan's status, Johnson said: "I'm being cruel to be kind, he needs to move to where he can play regular first-team football, because he is good enough. He added: "I'm on the verge of inviting another striker into our group." Northampton get their pre-season campaign underway with a trip to Brackley Town on Saturday, before games with Oxford City and Steve McLaren's Nottingham Forest. And while Johnson expects to use his "big hitters" in the games, he added: "There's always shirts up for grabs."